These incredible ceramic ionic hair brushes from the professional HeadJog range actually warn you when hair may be overheating! Head Jog's patented Heat Wave system incoprorates a red strip on the brush's barrel which actually changes to fluorescent yellow when hair is being blow dryed above 60°C. This essentially warns you that prolonged drying above the temperature can damage hair that has no heat protective serum on it. These Headjog Barrel brushes feature Ionic bristles that not only help the hair cuticle to retain moisture thus minimising split ends and broken hairs, they also restore life to damaged hair and have a deodorising action to boot. The Ceramic-coated barrel emphasises the hair's natural shine with a smooth polished effect.and it can also helps to reduce static build-up in the hair. 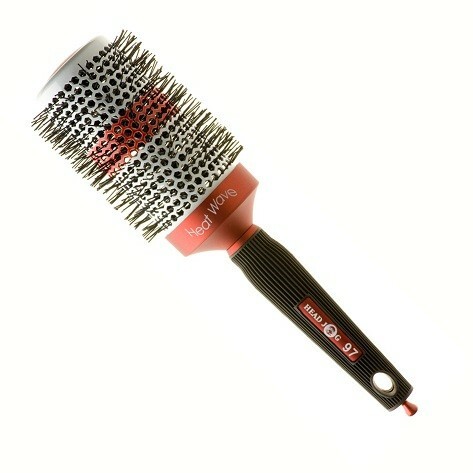 The built in vent holes allow warm air get to the hair roots making drying and styling faster and more effectivem, and like all HeadJog brushes, it features ergonomic design for comfort and great control.